Sungai Klah Hot Springs is nestled in the serene and lush forest patches, surrounded by hills and clear cold mountain streams and rivers. The 6.5 hectares retreat offers scenic view of a well-tended oil palm plantation and durian orchard amidst a haven of tranquility. 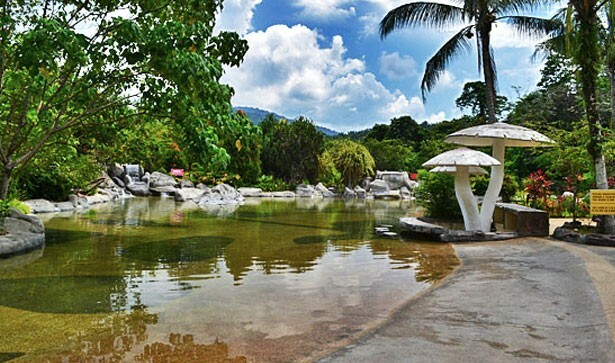 Its unique concept of a specially designed free flowing Hot Springs Swimming Pool and Therapeutic Park at the foothill of the Titiwangsa Range draws a sizeable amount of visitors. Another popular family activity not to miss out on is the hot springs egg-boiling experience. For visitors who are keen to experience the local Malay massage, the park offers one of the finest traditional massage packages. For more adventure, visitors can take on the challenge of the Sungkai River or work off the calories trekking in and around the park and soak in the natural wonders that surround the hot springs.